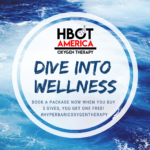 HBOT America of Houston provides mild hyperbaric oxygen therapy (mHBOT), BioDensity Workouts, Infrared Sauna Therapy, Resistance Band Training, and Leg Compression Therapy to a wide variety of clients, from athletes to those wishing to speed healing after surgery. We take pride in our clean and calm environment with our state-of-the-art equipment. It’s important to us that our clients feel relaxed as they take the next steps toward recovering, repairing and, rebuilding their body. HBOT America is accessible for the disabled, with a chamber that will accommodate a standard wheelchair or chair. Minors are welcome as clients, as long as they have parental permission and a parent stays with the child during the session. If you’d like a tour of our facility at no charge and no obligation, just click the button below. Our trained staff will be on hand to show you around and discuss how HBOT therapy may benefit you!